This World War I era trunk belonged to Richard Thornton. The trunk was restored (repainted, new handles, and new lining) and used as a keepsake saving WWI, WWII, and Korean War mementos from Richard Thornton, his brother Francis Thornton, and later his son James Thornton. Richard Thornton (1896-1973) enlisted on April 4, 1917. Richard was overseas from January 1918 until May 1919, when he was honorably discharged. On February 5, 1918, the steamship Tuscania was transporting over 2,000 American soldiers bound for Europe. The steamship was torpedoed and sunk by the German submarine U-77. 213 people lost their lives. Richard survived the attack. After his return home, Richard was a member of the Last Man's Club of Chippewa Falls and the Roy L. Vingers American Legion. Richard and his wife Elizabeth moved to La Crosse, WI and spent the rest of their lives there. This style of bayonet was introduced in 1902 as Germans simplified and strengthened their bayonet grips, bayonets were made shorter at the start of WWI since longer bayonets were weak, likely to break, and the delay in close combat when bayonets got stuck between enemy soldiers' ribs could be fatal. The U.S. 32nd Infantry Division was formed from Army National Guard units from Wisconsin and Michigan and fought primarily during World War I and II, the red line through a red arrow signified the tenacity of the 32nd in breaching enemy lines, the stiching on the badge "LES TERRIBLES" refers to the nickname given to the division while fighting in France during WWI. Knife with leather sheath, ornate flower patterns on blade and writing "VIVA MINAS," black and brown handle with grooves. Page with Richard and Francis from the "HONOR ROLL CHIPPEWA COUNTY WISCONSIN" book. The page is loose from the book and has tape around the image of Richard. The photo and caption was cut out and taped back in. 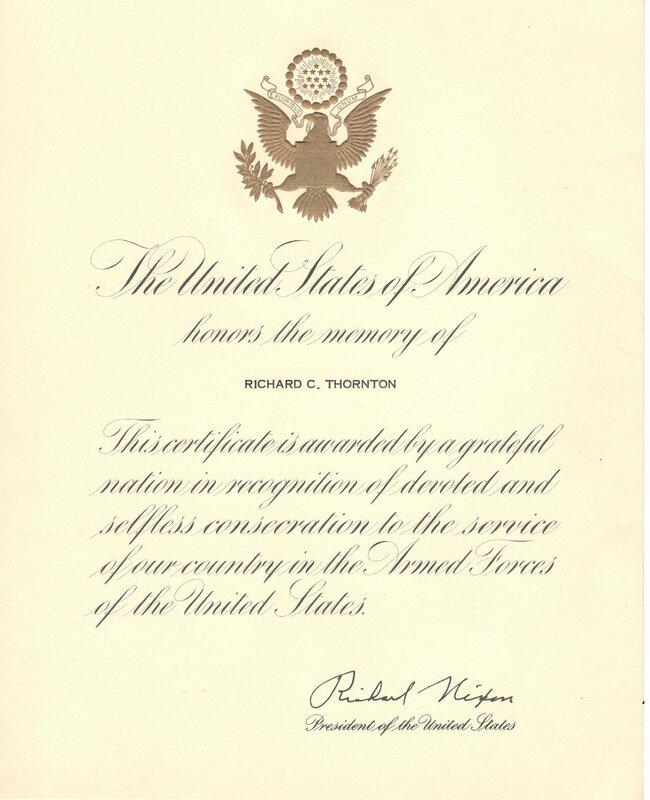 Memorial Certificate for Richard Thornton signed by Richard Nixon. Francis is pictured bottom just to the left of the center. A tribute to Francis Thornton published in the Catholic Digest. Written by Francis Beauchesne Thornton, book of poems. Written by Francis Beauchesne Thornton, book of poems-the latter half of which are religious in nature. Francis Thornton (1898-1963) was the brother of Richard Thornton. Francis and Richard had eight siblings. 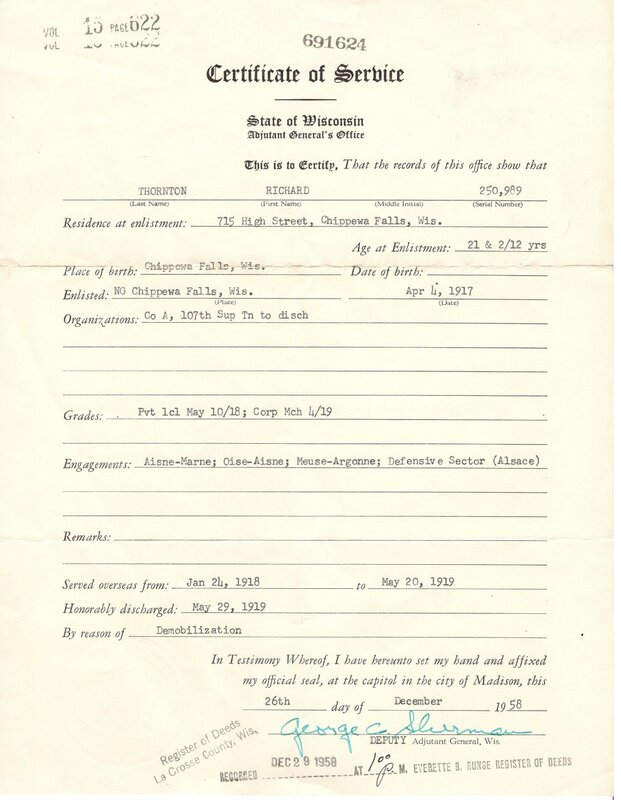 Francis enlisted October 7, 1918 and was mustered out December 21, 1918. Upon his return, Francis went on to university to study for the priesthood. During WWII, Francis served as a chaplain in the Canadian army. Later in his life, Francis worked as an editorial assistant at the Catholic Digest. He also authored multiple books. Some of his most valued possessions included: a letter of thanks from Pius XII after writing a biography of him and a relic of Pius IX set in a reliquary of topaz from the Sacred Congregation of Rites. James Thornton served in WWII in the Marine Corps. Mementos from James' Korean War service were saved and added to mementos saved by his father from WWI and were placed in the trunk. The Marine Corps uniform was not worn by James, but saved by him in an attempt to preserve his service. The dress uniform belonged to R.E. Currie--an acquantaince of James in the same barracks, Thornton bought Currie's uniform when Currie left the service as it was in better condition than his own. Korean War duffle of James Thornton. Marine Corps Platton 443 with James Thornton pictured. James Thornton's military issue tie-name stamped on the reverse. This dress uniform belonged to R.E. Currie--an acquantaince of James Thornton in the same barracks, Thornton bought Currie's uniform when Currie left the service as it was in better shape than his own. Inside cover of Marine Guidebook. Marksmanship badge- Machine Gun, Carbine. Korean War Marine Corps Garrison Hat.